Nothing about the Yowie phenomenon is straightforward. Reports can lead you in strange directions and ‘evidence’ is often confusing or contradictory. One case that perfectly illustrates this problem took place in the Northern Territory in August 1997. A convincing witness and terrific story but the supporting evidence is just – well, weird. The single witness was Katrina Tucker, a mango farmer from Acacia Hills, about an hour’s drive south from Darwin. Katrina was a great witness, and we talked several times by phone and once in person at her home in early 1998. Katrina and researcher Tony Healy at the site of the incident. Starting in about 1992, she and her husband had heard strange cries emanating from a wild region to the east of their farm. They were high-pitched, like those of a howler monkey. Whenever they occurred, her Doberman and German shepherd guard dogs “started to cry”. In mid-1997, cows began jumping fences; horses became spooked. One August night, Katrina was woken by the cries, which sounded closer and more distressed than ever before. Fearing an animal had become entangled in a fence, she jumped on a four-wheeler bike and rode out to investigate. Her dogs refused to accompany her, and she soon discovered why: speeding along the fence line, she almost collided with a huge, screaming ape-man. It was hanging onto the fence, leaning back as if attempting to tear it down. As the bike slewed to a stop about eight feet away, it stood up, looming to nearly seven feet. Covered in matted, dull, dark reddish-brown hair, it had very long arms, sloping shoulders and no discernable neck. It seemed more animal than human. Katrina was hit with a smell that made her dry-retch. It resembled a cave lull of bats, urine, or a badly kept hen house. Katrina Tucker on her quad bike, with researcher Tony Healy standing where the creature had been tugging at the fence. The animal turned and ran. Its arms did not “pump” as a humans would, nor did it bend its elbows. It ran by bending its knees, and swayed from side to side. Although it took large strides, it appeared almost to run in “slow motion”. Katrina’s first sketch of the creature. The extra lines were made by a fax machine (remember those?). Katrina knew nothing of the yowie phenomenon and assumed the creature was some kind of great ape that had escaped from a menagerie. Whatever it was, she hadn’t imagined it; in the morning she found a line of fairly well defined footprints at the site. Katrina’s second sketch of the creature. The Tuckers continued to hear the yowie’s cry from time to time and on one occasion it left them an unsolicited gift: very close to where Katrina saw the animal, they found a devastatingly foul, cigar-shaped dropping of gargantuan proportions. So – great story, impressive witness, other nearby reports and tracks that were inspected by others and cast. But those tracks are a real problem. They were very strange indeed. Around 310 by 160 centimetres [12 x 6 ins], they displayed three long, sausage-shaped toes, a small “thumb” protruding from the instep and rather “squared-off” heels. They look anything but natural. The trail of prints near the fence, each track marked with a rock. Shorty after Katrina’s sighting, the tracks were inspected by local naturalist Ian Morris and cast by Karen Coombes and Jenny Risler of the Northern Territory Museum. Jenny Risler, NT Museum and Galleries taxidermist, makes a cast of one of the prints. Although they (and I) never doubted her honesty, both thought Katrina must have been hoaxed. Local police were non-committal, although one tall officer noted that he couldn’t stretch to duplicate the stride of whatever had made the prints. Improbable-looking as the tracks were, it is still difficult to imagine how a hoaxer could produce screams calculated to unnerve dogs or generate a smell foul enough to make a person almost vomit. The hoaxer would also have to have been extremely tall and very well kitted-out with a fur suit and those weird false feet. He must also have been very foolish and very lucky. Acacia Hills is a wild area and mangoes are valuable fruit. Katrina had been known to set her dogs onto intruders. She earlier had driven one away with gunfire. So – a great story, a believable witness, but flawed supporting evidence. Write the whole case off? 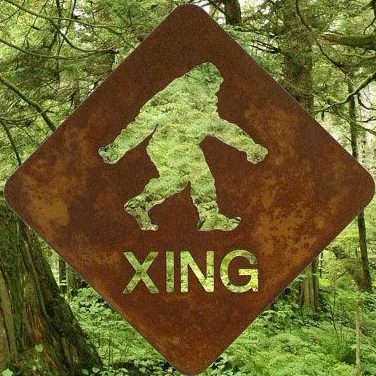 Not yet – it goes into the ‘Interesting But Strange’ file, along with quite a few other other of our more puzzling Yowie reports. WOW, awesome story, it is the distress screams that make me wonder what is happening in the mind of the Yowie! It seems there are screams from all the beings of this decent and I feel they are being manipulated by something higher and mightier than them and they are really in DISTRESS and yelling for someone to listen! Just my thought!